Located on Dekalb Industrial Way just north of N Decatur Rd, Extra Space Storage serves residents of Decatur, Scottdale, Clarkston, Avondale Estates, North Decatur, and North Druid Hills. Locals will recognize our facility across from Paces Park Apartments north of Walgreens and Texaco. 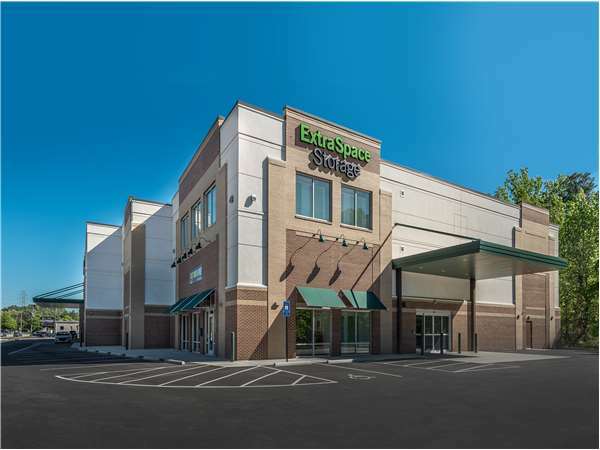 Extra Space Storage is about 2.5 miles from Agnes Scott College and 2.7 miles from Emory University, making us a great option for college students in the Atlanta metro who need self storage! With a variety of storage units, climate-controlled storage, and exceptional security, Extra Space Storage on Dekalb Industrial Way has the Decatur self storage options for you! Store items large and small with ease at Extra Space Storage! Our Decatur storage facility has units ranging in size from 25 square feet up to 200+ square feet with features like first-floor access and elevator access. With advanced security measures like 24-hour video surveillance at our Dekalb Industrial Way storage facility, you can store valuable items with peace of mind. Protect delicate items from extreme heat and humidity in Decatur by storing them in a climate-controlled unit! Climate control keeps your unit between 55 and 80 degrees year-round. At Extra Space Storage, we strive to provide dependable self storage with excellent service. From our well-maintained, secure facility to our friendly, professional staff, we work hard to deliver an incredible experience for each and every customer. Contact us today to reserve a storage unit in Decatur! Extra Space is a clean, climate-controlled, high-security, easy to access place. I love the friendly staff and location. Lenny in Decatur goes above and beyond to assist you. Easy storage is an excellent place to store items without the hassle of water from rain getting into your unit and mold growing on your furniture. Customer service is awesome. Great service, reasonable price, very convenient, clean, clean, clean, excellent customer service!!! This is a very clean, well organized storage facility. We have access from the ground floor. The employees are very helpful and friendly. I can wholeheartedly recommend this place. Drive south on I-285 S. Take Exit 39A and merge onto US-78 W. Turn left onto Dekalb Industrial Way. Our facility will be on your right after Milscott Dr.
Drive north on I-285 N. Take Exit 40. Turn left onto Church St. Turn right onto N Decatur Rd. Turn right onto Dekalb Industrial Way. Our facility will be on your left after Texaco. Drive southwest on E Ponce de Leon Ave. Turn right onto N Decatur Rd. Turn right onto Dekalb Industrial Way. Our facility will be on your left after Texaco. Drive east on N Decatur Rd. Pass DeKalb Medical North Center and continue east. Turn left onto Dekalb Industrial Way. Our facility will be on your left after Texaco.